As I promised when I made the crock pot version, I have now made the oven version and I do love this one the best! Mix the salt and pepper together and rub over all sides of the pork. 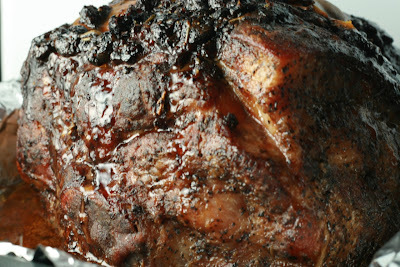 Make 5 slits each on the top and bottom of the roast and insert a garlic clove and sage leaf into the slit. Wrap the roast in plastic wrap and refrigerate over night. place flour on a plate and pat flour on pork, coating all sides. Dust off excess flour. Hear oil in a large skillet over medium high heat. Brown pork on all sides, until golden brown, about 15 minutes. Transfer meat to roasting pan. 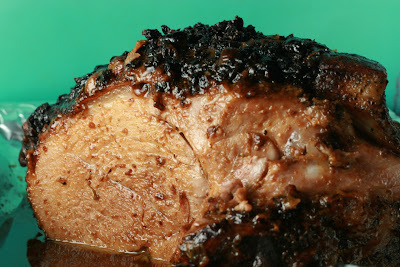 Combine 1/2 cup of Alma’s mustard with the brown sugar, Worcestershire sauce and bourbon. Stir until smooth. Smear the meat with about 1/2 to 2/3 of the mixture, or enough to coat all sides of the meat. Cover the roasting pan with foil. Roast meat for 4 hours. Remove foil and spoon the remaining mixture over the top of the roast. Return to oven and roast uncovered for an additional 2 hours, or until the meat is completely falling off the bone.